Crafted in luxurious 18ct gold and styled with a delicate twist, this sparkling diamond solitaire is set with a hidden diamond inside the band and features a total of 1/3 carat diamonds in weight, and delivers undeniable elegance for the modern woman. Each Forever Diamond has been independently certified by the GSI for colour, clarity, carat and cut. 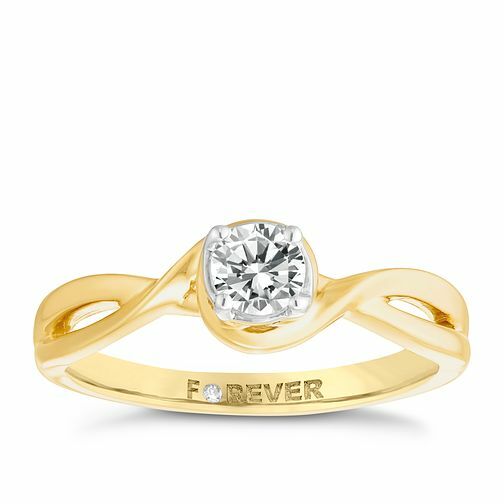 18ct Gold 1/3 Carat Forever Diamond Twist Ring is rated 5.0 out of 5 by 1. Rated 5 out of 5 by Anonymous from Nice and clear diamond. Very comfortable and beautiful ring. I bough it to treat myself.